Stainless Steel Tubing Cutters is rated 4.0 out of 5 by 4. Rated 5 out of 5 by Hank84 from Good all around tool This tool is a great tubing cutter for stainless pipe. I would recommend them to any one who cuts stainless pipe or conduit. I use them almost everyday. They cut up to one inch great. 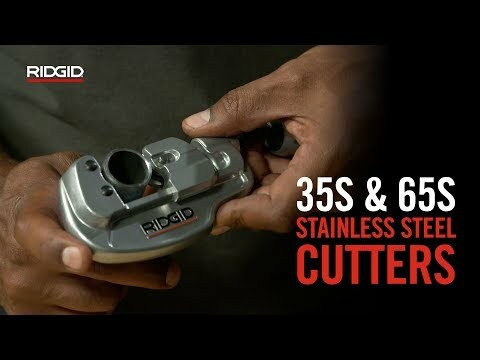 I really like ridgid tools they are very dependable tools too. Rated 5 out of 5 by denthewiz from Great cutter Over the years I have used many tubing cutters to cut stainless steel tubing with little success. I finally bought the Rigid E 635 and it has been great. I have made many dozen cutts and it is still on the original cutting wheel. What is the maximum thickness of stainless steel tubes that can be cut by 31803 cutter? Is 65S can cut the PVC or need other wheel ?